The damage over time lasts for longer. Splits the projectile, allowing it to affect two additional nearby enemies. Sun Fire: Blast an enemy with a charge of radiant heat, dealing [3690 / 3732 / 3771 / 3812] Flame Damage, an additional [4493 / 4539 / 4590 / 4641] Flame Damage over 5 seconds, and reducing their Movement Speed by 40% for 3 seconds. Upon activation you gain Major Prophecy, increasing your Spell Critical rating by 2191. Vampire's Bane: Blast an enemy with a charge of radiant heat, dealing 3809 Flame Damage, an additional [7613 / 7692 / 7775 / 7862] Flame Damage over 9 seconds, and reducing their Movement Speed by 40% for 3 seconds. Upon activation you gain Major Prophecy, increasing your Spell Critical rating by 2191. Reflective Light: Area: 4.5 meters. 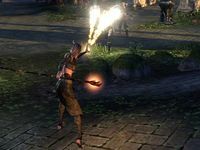 Sun Fire deals Fire Damage to the targeted enemy and applies Fire Damage over time, as well as giving a Spell Critical boost to you. 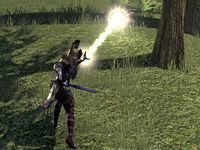 Vampire's Bane increases the duration of the Fire Damage, making it more effective against single targets, while Reflective Light causes the spell to affect up to three targets with each cast, which makes it more useful against groups. Despite the name, Vampire's Bane does not do more damage specifically to vampires, except in as much as it is Fire Damage, which vampires receive increased damage from in general, though this is true of all three versions of this spell. Vampire's Bane is a recommended morph for the Templar Initiate and Gleaming Champion builds. This ability's damage-over-time now lasts 1 additional second, and deals 10% more damage. Fixed an issue where casting Sun Fire wouldn't cause you to face your target. Reflective Light: The tooltip for this ability now includes the damage-over-time. Fixed an issue where the Sun Fire snare duration wasn't being increased by the Enduring Rays passive. Reflective Light: Fixed an issue where this ability was applying two snares to secondary targets. Increased the damage over time dealt by Sun Fire and its morphs by 30%. While Sun Fire is active on a target, the caster will gain the Major Spell Crit buff. Vampire's Bane: Increased the damage over time duration for this morph to 9 seconds from 7 seconds. Shadow Cloak: Fixed an issue where the invisibility from this ability and its morphs was being broken by numerous abilities including Reflective Light, Silver Shards, and Burning Talons damage over time effect. Decreased the duration of the snare from this ability and its morphs to 3 seconds from 5/9 seconds.